While visiting the butcher, I noticed that they had some different types of morcilla for sale, not just their usual one made with onions and pine nuts. Morcilla is Spanish black pudding, traditionally made at matanza time, where the family pig is killed to provide food for the coming year – nothing is wasted. The ingredients vary by region and can included onions, rice, pimenton, pork fat, cinnamon, oregano, pine nuts, cloves, garlic, etc. Pigs’ blood is the main ingredient. I asked Graham (the butcher) where the morcillas came from and he offered me a sample to try. It must have been my lucky day – I came home with about half a pound of blood sausage. 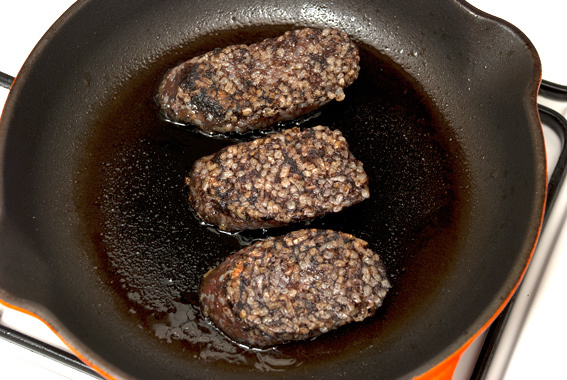 Morcilla de Burgos is typical blood pudding from the city of Burgos (capital of Castile), which normally contains rice. This black pudding was quite spicy and had a pungent, Moorish smell. I could see pieces of onion in it and believe it was flavoured with cumin and coriander. 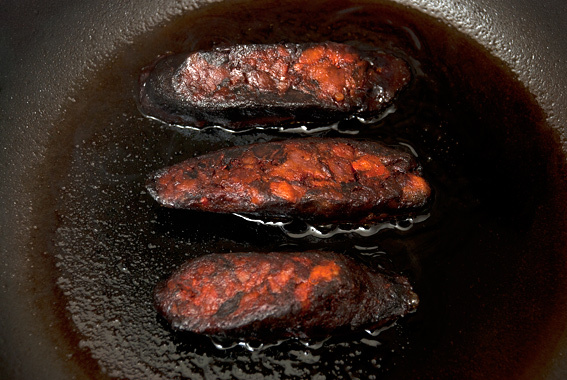 It’s a great morcilla for frying in a little olive oil as a tapa, but would go equally well with fried egg and beans. The texture reminded me of Clonakilty black pudding from Cork. 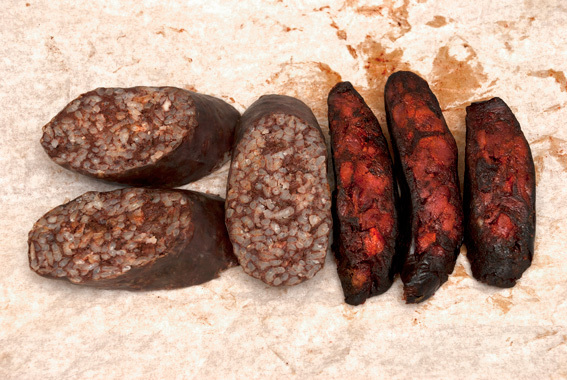 The above, deep red morcilla comes from Cataluña. I can’t say that I’ve particularly noticed this type before in Barcelona, but it’s not completely uncommon to have a black pudding spiced with pimenton, which is what gives it the red colour (like chorizo). The pudding contained chunks of fat and possibly pork meat. In spite of the pimenton, it wasn’t very spicy, but it did taste rich and the texture was smoother than that of morcilla de Burgos. This morcilla didn’t fry particularly well – it went a dark red/black colour (almost beetroot), quite quickly. I think it would be best suited as an ingredient in a Spanish stew, rather than as a tapa. I enjoyed both morcillas with some pan con tomate, but they’d be great in a Spanish omelette too! This entry was posted in Food, Meat, Shopping, Spanish and tagged black pudding, blood, Burgos, butcher, Cataluña, cumin, morcilla, pimenton, pork, rice. Bookmark the permalink. Wow – never saw Morcilla when I lived in London and this is something I always have to pack in my case when I go back for friends and family. Our local morcilla doesn´t have rice – and sometimes it has onion or not. I adore morcilla (even though it´s not great for the cholesterol). Everything in moderation though!